There are a lot of bad jokes out there. Some of them are based on overused puns that make people groan when they hear the punchline but will ultimately get repeated by dads throughout the world. Then there are those bad jokes that come on the back of candy wrappers and just make you confused. And finally, there are the bad jokes that this vintage clown simply loves– the spooky trick. This clown is funny, sure, but she's full of surprises. Instead of making the traditional dog and teddy bear balloons, we wouldn't be surprised if she twisted up a creepy scorpion balloon. And let's not forget the ol' waterspout in the bouquet trick. We wouldn't want to know what she has hidden in her handful of roses but we're keeping our noses far away! This Halloween, let your little one lean into her love of bad jokes with this vintage clown costume. This vintage-look costume treads the line between timeless and spooky. 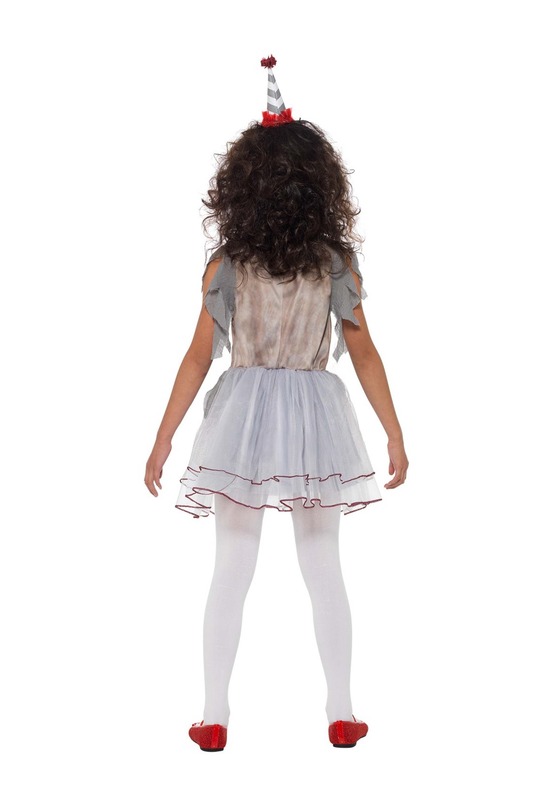 While the dress has touches that make it look aged like the off-white pattern of the top and the tattered gray sleeves, it's adorable enough that grandma and grandpa will still love your little one's Halloween look. Gray and white stripes on the bodice suggest suspenders and the skirt is layered with light knit mesh. The bodice is accented with satin rosettes and the over-sized bow tie. 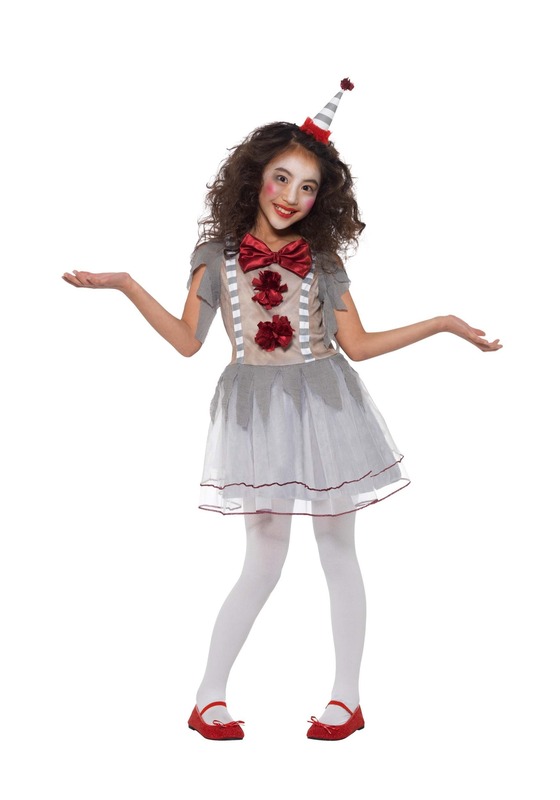 Your child will love performing in the dress on Halloween night whether she's clowning around or stirring up some scares. You can take this costume as far as you like with makeup, wigs, and torn or polished tights. Just remember to get out your camera and document your little clown's antics. This is one performance no one will want to miss!